Who says you can't have a BIG bowl of 'pasta' in the summer? With our version you can go ahead and sit in front of a HUGE bowl of nutrient dense, low carb and low calorie spaghetti squash! We aren't stopping there, we are pouring a hefty portion of our delicious and LEAN ground turkey meat sauce over top. This is one Italian meal you don't have to feel guilty about eating. We start off by tossing the above items into the food processor which becomes the base to our tomato sauce. 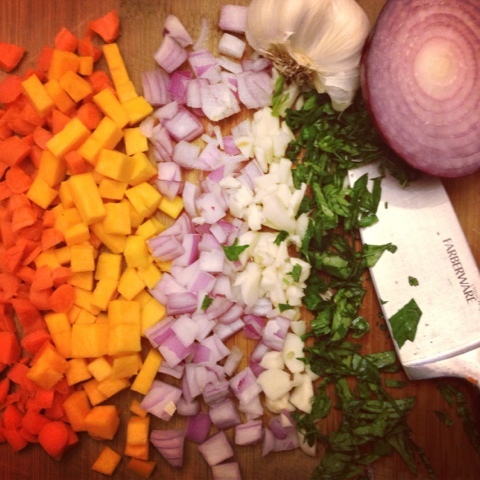 It's probably no surprise to you that our sauce is packed with veggies. 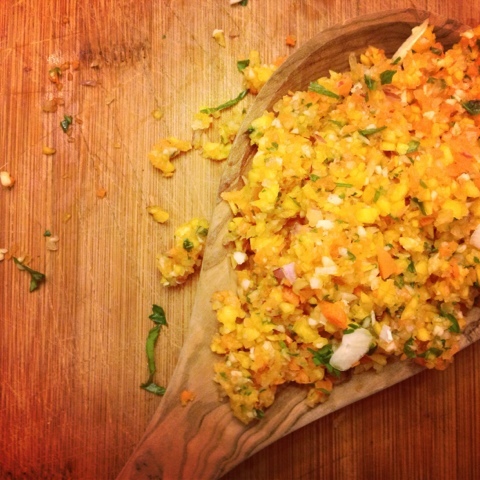 Simply toss carrot, onion, garlic, sweet potato, and basil into the food processor and blend away! Serve this sauce over a heaping bowl of spaghetti squash to leave you feeling full and satisfied! Hope you enjoy this healthy and delicious dinner! 2 cups cooked spaghetti squash per person! 5. While sauce is simmering cook spaghetti squash. Cut spaghetti squash lengthwise and scoop out the seeds. Add one half to a microwave safe dish and add one inch of water. Cook one half on high for 15 minutes, and then repeating with the second half for another 15 minutes when finished. Use a fork to scrape the 'pasta' into strands. Hello! I was delighted to stumble across your amazing website today when trying to plan dinner for my husband and myself! My mother in law gave me a veggie noodle maker for Christmas; do you think that this recipe would taste amazing with Zoodles (zucchini noodles)? I'm going to give it a try and let you know! I am so GLAD I found this blog and recipe! 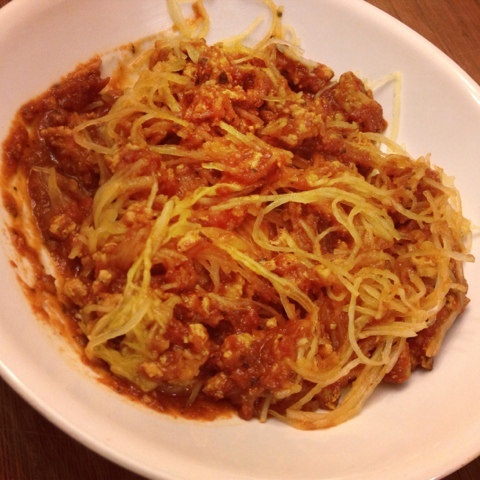 I was trying to find a recipe using spaghetti squash for dinner, and I stumbled across this! This was SO GOOD! I cooked this on Sunday and had lots of meals since it is only me! I will DEF. be making this a lot, super easy and super yummy. And I love the big portion but low calories! !